At Kennesaw Mountain Dental Associates, your safety is our top priority! At our family dental practice, you can rest assured that our dentist and staff are highly focused on protecting the health and safety of each and every one of our valued patients. We pride ourselves on not only meeting but also exceeding OSHA standards for safety and cleanliness. 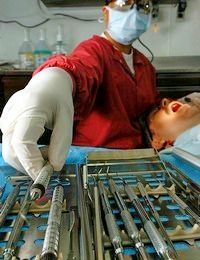 Unfortunately, dental safety has been the subject of many news stories as of late. Although the occurrences of cross contamination are rare in the dental setting, there is a definite need for continued vigilance and attention to detail to prevent these instances from occurring. At Kennesaw Mountain Dental Associates, we maintain a neat, clean and orderly office at all times. 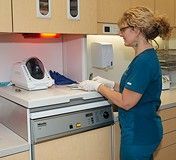 Our dentist, dental hygienists and dental assistants wear new masks and gloves anytime they have patient contact and wash their hands between each patient and frequently throughout the day. We also sterilize the treatment area before and after your visit. Since controlling contamination through sterilization is the most essential component in infection control, we take it very seriously. Instruments that can withstand high temperatures are sterilized in a steam autoclave under pressure. Our autoclave sterilizers are monitored on a strict schedule to ensure that they are working at peak performance. In addition, we use disinfectant procedures on surfaces and equipment that cannot be removed for cleaning. This includes counter-tops, drawer handles, light handles, etc. These surfaces are disinfected before and after each patient. Many of the items we use for patient care including gloves, masks, wipes, paper drapes, saliva injectors and needles are disposable. These items are used only one time and then are disposed of properly. We use special containers to safely dispose of sharp, contaminated materials. We hope that our extra safety precautions will give you an added peace of mind when you are visiting our dental practice. If you have further questions regarding our safety practices, please feel free to call us at 770-927-7751. We look forward to serving you with top quality, safe dental care.